Tuesday was a big event as the family headed north for the infamous Jellema Family Holiday party! It's a well-known fact that Santa makes an appearance at this gathering. Cameron wasn't too sure about the big guy with the white beard, so he wasn't too keen on having a photo op take place. However, there were still plenty of more pictures throughout the day. Cam had fun seeing all of his cousins, especially Steff, who traveled from Kentucky! Santa gave all of the kids presents and Cameron gladly opened more boxes and had a great time with everyone. New Year's Eve was spent with Annie as Cameron watched his parents and his nanny try to figure out all of their new Wii games. He certainly thought they all looked silly! A big thanks to Grandma & Grandpa for staying with their grandson overnight on Saturday so that Chris and Jane could enjoy a post holiday evening at the JW Marriott. 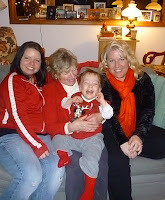 Cameron was such a good boy for his grandparents and Chris & Jane were very grateful for that!